These Thai grilled pork skewers are slightly sweet, a traditional Thai recipe that’s thinly sliced pork marinated in a marinade made with fish sauce, coconut cream, cilantro, and white peppercorns and known as Moo Yang in its native land. 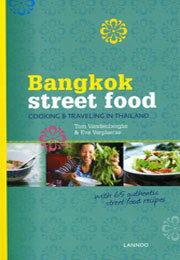 The author of the lavishly photographed and terrifically well-researched book Bangkok Street Food, Tom Vandenberghe, explains that cilantro root is relied on quite often in Thai cooking. It’s just a little less assertive in flavor than the cilantro leaves you’re accustomed to using. If you can’t get your hands on them at an Asian market, maybe you dig up one of your cilantro plants from the garden or make a trip to your local nursery and buy a plant specifically to be sacrificed for this recipe. Then just wash, scrape, and finely chop it, he explains. If you can’t find cilantro root, no worries, use cilantro stems instead. It won’t be exactly the same thing, but it’s the next best option. Either roots or stems work to a fare-thee-well in this recipe, in which the cilantro presence is a subtle, intriguing hint rather than a whack-you-in-the-face-like-a-baseball-bat hit. 1. If using wooden or bamboo skewers, soak them in water for at least 1 hour to prevent them from burning. Meanwhile, combine all the ingredients but the pork in a large bowl and mix well. Add the pork and marinate for at least half an hour. 2. Fire up the grill (preferably a charcoal one) and let it settle on medium or medium-high flames. 3. 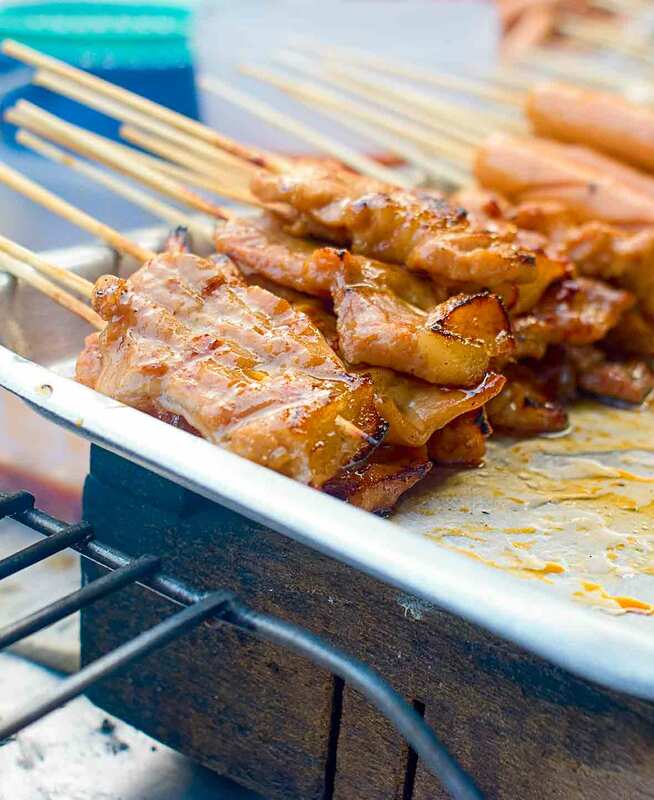 “Weave” the strips of pork onto the skewers, allowing as much of the marinade to cling to the pork as you desire. Grill, turning a few times, until the pork is cooked through, 5 to 8 minutes. Serve the skewers immediately. Some moo yang vendors present customers with the pork in slices on a plate, minus the skewers, along with cucumber and fresh herbs. The skewers also go really well with green papaya salad and, natch, rice. Thai Grilled Pork Recipe © 2010 Tom Vandenberghe. Photo © 2010 Luk Thys. All rights reserved. All recipes and photos used with permission of the publisher. We loved this salty and sweet barbecued pork! The creamy marinade clung to the meat during grilling, so even when you don’t have a lot of time for marinating, you get to enjoy all the flavor the fragrant sauce has to offer. If you want to enjoy moo yang when outdoor grilling isn’t an option, you can thinly slice the pork tenderloin and sear them in a skillet. The marinade for this pork is sublime. It contains garlic, cilantro, pepper, fish sauce, soy sauce, coconut cream, oil, and a touch of sugar. That’s it! Sounds great, doesn’t it? Trying these for the first time was one of those closing-my-eyes-in-pure-joy moments. The recipe recommends marinating the meat for at least a 1/2 hour but I did for nearly 2 hours, after which time the marinade (the coconut cream, really) solidified in the fridge. After wiping the marinade off, we grilled the pork. The sugars in the marinade caramelized nicely, especially the ends, and my husband and I took turns sneaking those best bits. Oh, what flavor! The meat didn’t need any sauces or embellishments whatsoever. It stood up very well on its own. The meat really picked up the fish sauce, cilantro, and coconut-cream flavors especially, and they complemented each other so well. I was unable to find cilantro root but I used cilantro stems and leaves from my garden. Even cilantro haters would like this because the flavor isn’t in your face. After dinner my husband said, “You should make this at least once a week!” That says it all. Make it. Love it. This dish comes together quickly and is full of flavor. If you can find cilantro root, it’s definitely worth seeking out. The flavor of the root is much milder than that of cilantro stems. The coconut cream lends a richness to the pork while the soy and fish sauces make it savory. Marinating the pork for at least the recommended time makes all the difference—the longer, the better. Winner, Winner, pork dinner! Did this for the family BBQ today and everyone loved it. The marinade was easy to put together. The addition of coconut cream was a real surprise to me, as I was concerned that it might be too much coconut. There was a hint of coconut in the background, but if you weren’t aware of what it was, then you certainly wouldn’t have guessed it. I doubled the recipe given the number of guests I had coming, and it doubles easily. The results were tender and tasty and the recipe easy to make. I’ll certainly be adding this to my special list of recipes for the grill. Don’t be fooled by the smell of the marinade! I must admit that I was worried, as the mixture certainly did not have the most appealing aroma. The end result, though, was absolutely fantastic. The pork was juicy and creamy, tasty yet not overpowering, and the aroma was actually quite nice too. I used pork loin and cut it according to the instructions. Due to my crazy work schedule I actually let it marinate for about 2 hours. Definitely a recipe I’ll make again. Wonderful and easy. Kind of salty from the fish sauce, but I love it that way. Grilled up in just a few minutes. I used pork tenderloin, thinly sliced at an angle, and cilantro stems instead of roots. Amazing how a few simple ingredients can make such a big impact. This was easy to make. I used a 1-pound pork loin and sliced it thin. Marinated it for over an hour and grilled on a charcoal grill at medium heat for about 8 minutes. It was moist and flavorful. Great as an appetizer or part of a main meal. This is going to be a staple recipe in our family. What a great recipe for the grill. We had a fantastic time skewering up the meat. There was much anticipation as we sat next to the barbeque taking in the aroma of the pork as it cooked. The flavor didn’t disappoint. Everyone at the table had seconds, some had thirds. The ingredients are uncomplicated and simple to find. The process is quick and easy. The result is a great meal in minutes. This was easy to make and the results were delicious. It makes a great, quick, midweek meal. These pork skewers were easy to make and took very little hands-on time. I cheated just little and pulsed the marinade ingredients in the blender, which made it even easier. I used pork tenderloin, which made for extremely tender skewers of meat. I would recommend only turning the skewers once instead of often. I served this with a cucumber and peanut salad. Some lime wedges served alongside and squeezed over the pork at the table really enhanced the flavors. I made this last week and it was great! I used pork tenderloin and cilantro because I didn't have time to go get cilantro root. This reminded me a lot of the Vietnamese version (Thit Nuong), which usually has finely chopped lemongrass, but this had the addition of cream of coconut, which added a great flavor. I served this with rice vermicelli noodles, shredded romaine, diced cucumber, and fresh mint and cilantro. A word of warning that the fish sauce can be a little overpowering to those not used to it, though it's used in much Thai and Southeast Asian cooking. If you don't like fish sauce, I think you could sub soy sauce and still come out with something similar. Oh those pesky house guests, huh?! Oh I have pork tenderloin in the freezer – I’m making this recipe this week – and I just ordered the cookbook – looks very interesting. I finally got around to making this recipe tonight. It was so delicious! I served it with jasmine coconut rice and sauteed summer squash. My husband loved it. I will definitely make this again! We’re glad to hear you sharing and spreading what we’ve heard time and again from every single person who’s made these skewers, Jackie. Many thanks for chiming in…. Lovely to hear it, Ngoc. It’s an incredibly versatile marinade, isn’t it? Now that it’s warm enough to fire up the grill, this is the first thing my kids asked for this season. We all love this. Looks like someone raised their kids to have great taste, Jill! 5 stars! This is one of my go-to recipes!!! Love it. Thank you for sharing. You’re so very welcome, Rekha! Lovely to hear you like it as much as we do. I look forward to hearing which recipe from the site you try next! This is my favorite way to cook. All the prep can be done first thing in the morning and left to marinate. When dinnertime rolls around, it requires only a quick grilling. I served this with a warm cabbage salad https://leitesculinaria.com/11529/recipes-warm-cabbage-salad-crispy-tofu.html and a side of coconut rice. Beautiful bold complex flavors for so little effort. Always a relief when quick is still satiating, yes?! Love these skewers and so happy that they’re now a staple for you as well, Beth.